Welcome to the Holiday Stashdown CAL! This week I have prepared a pattern for you to crochet with a single ball of Red Heart With Love Yarn. This is a quick-and-easy Berries Jubilee Infinity scarf pattern and it is crocheted using an easy-to-remember stitch pattern. To keep in theme with the CAL I pulled a ball of yarn from my own stash for this project! 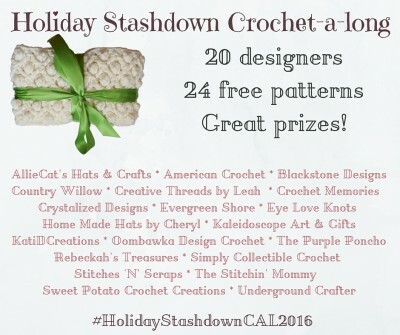 This pattern is just one of 24 free crochet patterns by 20 designers in the Holiday Stashdown Crochet-a-Long. Yarn: Red Heart with Love Yarn. Color: Plum Jam. (5 oz • 141 g; 230 yds • 211 m). 100% Acrylic. Rep R2 and R3: 34 more times. Finish off leaving a long tail for seaming. 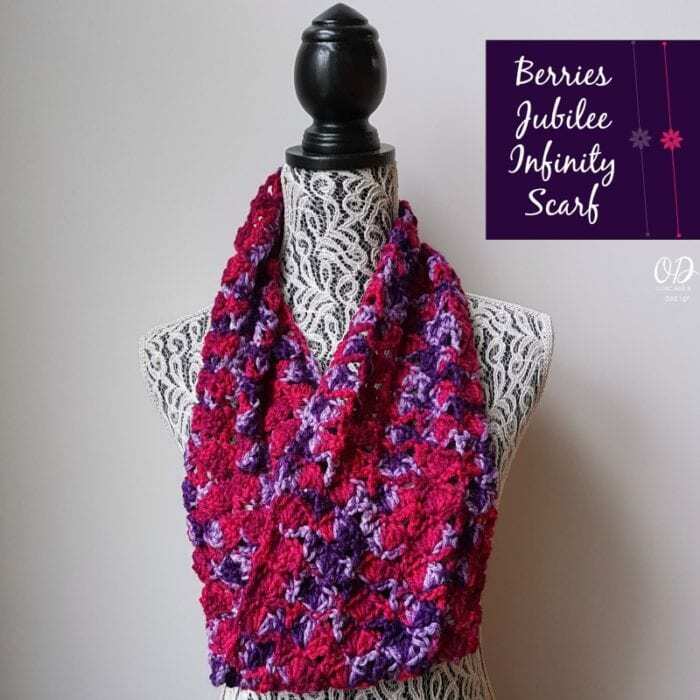 You will be sewing the ends together with a slight overlap; to form an infinity scarf. If you wish, you may add a mobius twist to the project but I did not. Simply line-up the first and last rows worked, so they touch at the edges. Next, slide R71 on top of R1 until the Shells (i.e. the 5 dc sts worked in one stitch) overlap each other. 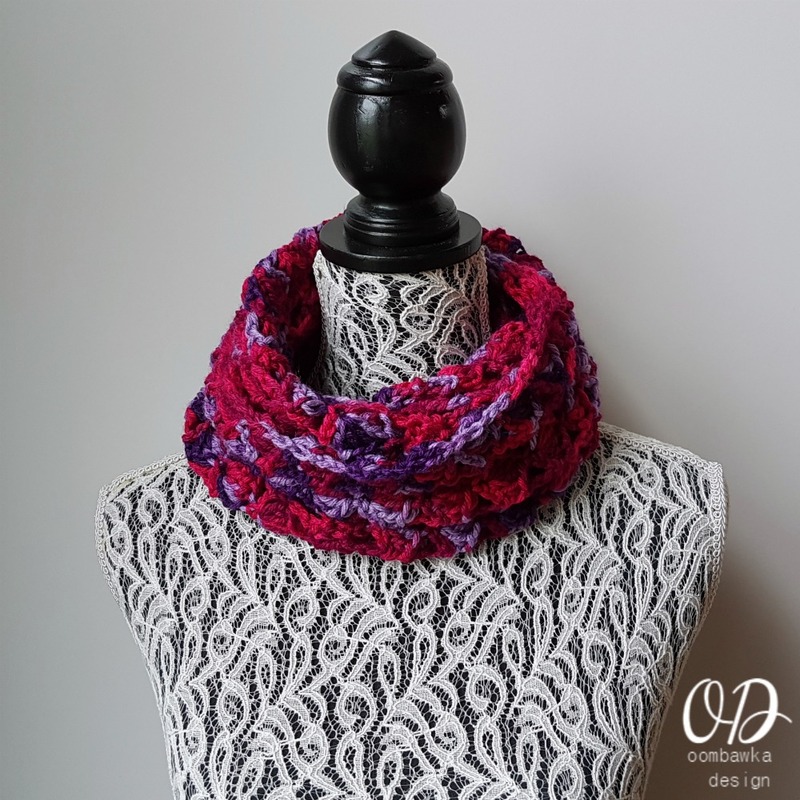 Note: You want the nice edge to show on the outside of your work; so, you may need to flip your project so the wrong side (WS) is facing you when you seam the scarf. 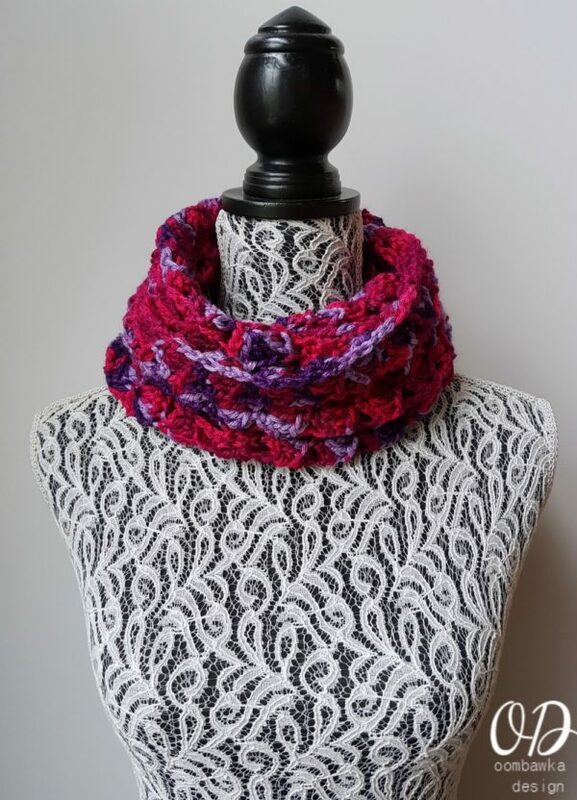 Finally, seam through both layers (I used a Running Stitch) to create an infinity scarf. Finish off and weave in any remaining ends. Rhondda when you made this scarf for a child did you make it shorter. I have a 2 and a 4 year old. I think this would be a little too long for them. I’ve finished the hats for them and I love this pattern. Thank you for sharing with us.